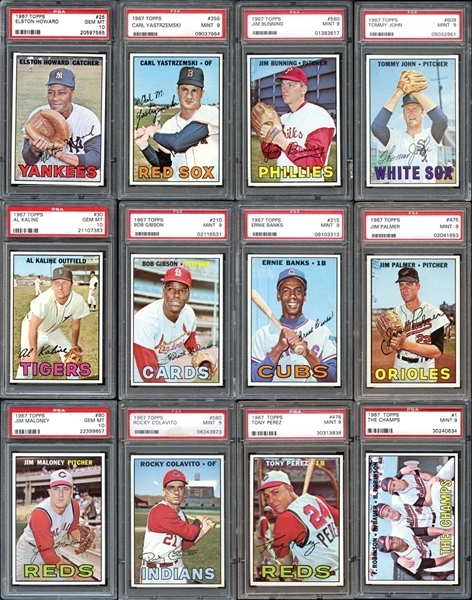 Just as they did exactly a decade prior, Topps went back to on-field shots for the majority of the cards in the 1967 Topps series, however, the quality of the snapshots far surpassed any that came before it. The 609-card series features key rookie cards of Tom Seaver and Rod Carew with a high-number series filled with difficult but attainable cards in top grade. There are even a few quirky variation cards that are fun to collect if you can find them and a classic portrait shot of Mickey Mantle against a baby-blue backdrop that many collectors think is his most attractive card of the decade. 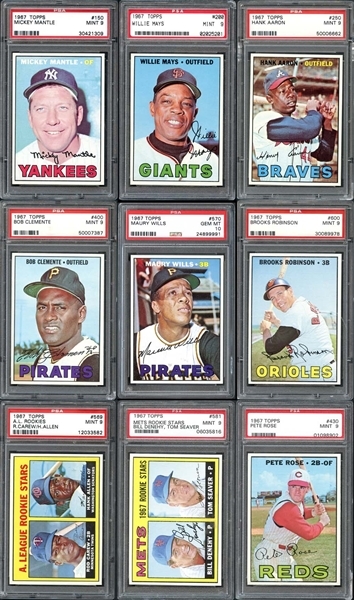 Yup, the 1967 Topps set has it all and the featured collection is one of the best around, ranked #4 overall on the PSA Set Registry with a set rating of 9.444 and just two commons short of completion (#505 and 572). There are 154 cards, a little over 25% of the set, that have achieved a grade of PSA 10 GEM MINT, most notably #30 Kaline, 240 NL Batting Ldrs., 570 Wills and six others from the difficult high-number series. The large majority of the collection, 433 cards or just of 70% of the collection, is graded PSA 9 including every other major star. Card #38, 135, 137 and 145 are "one of one" PSA 10's with 75 of the PSA 9's also topping the pop report as the highest ever graded. This collection is being offered as a complete set as well as each card offered individually, with the final sale going to whichever total (the set versus the sum of the individual lots) is higher. This gives prospective bidders the opportunity to examine each and every card in the collection through the use of our high-quality scans. For a complete breakdown of grades and population for each card, please visit our website for a link to the PSA Set Registry.